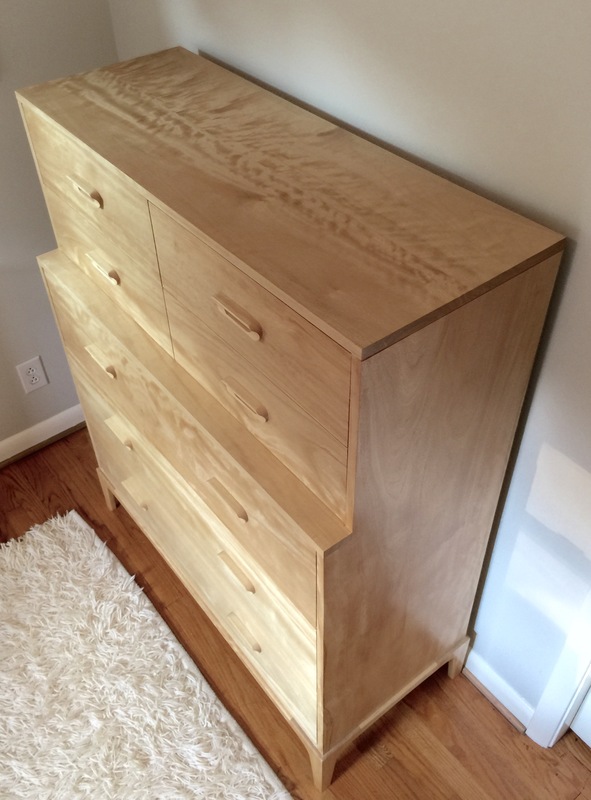 These past few months I took on my most ambitious furniture project to date – a full size dresser for my daughter. I wanted to add some visual depth to the standard box of drawers, which would be in the mid-century style. My search for inspiration images lead to a fantastic collection of mid-century furniture photos compiled by a fellow name Whit Blazemore on flickr. I settled on a step back design – the top drawer section (2×2) would set back a couple inches from the bottom section (1×3). I also did not want to have any division between the drawers, the front would be uninterrupted. 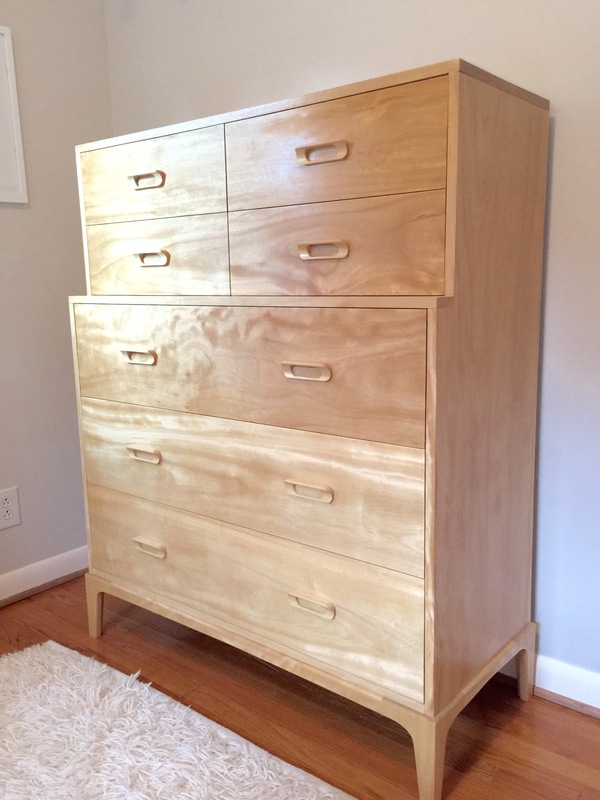 And since this was my first dresser I wanted to do it right with dovetails all around. 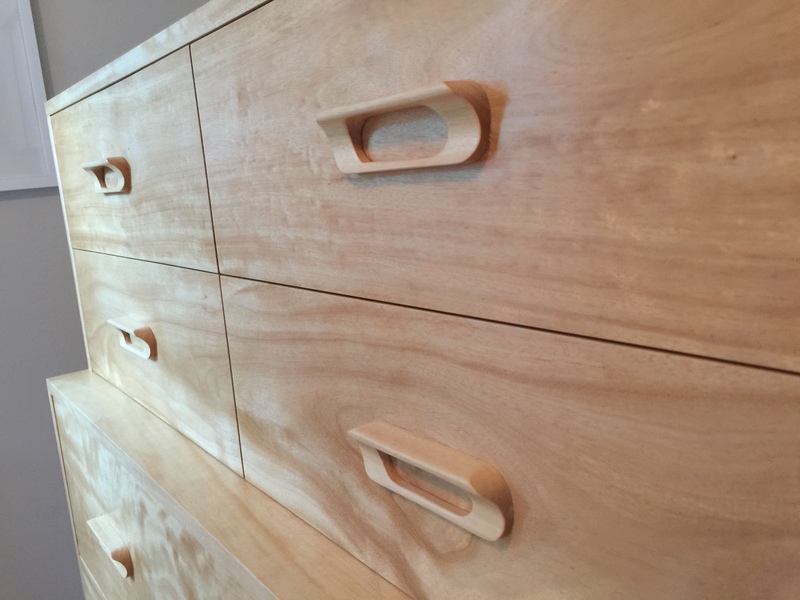 To accomplish these requirements, I knew that I would need some overhang on drawer fronts in various spots to cover the structural dividers within. I wasn’t exactly sure how I was going to pull this off, but I knew the case construction would be fairly standard so I started there and knew that I would figure out the final details as I went. Ultimately the top drawers ended up as false fronts hanging on side slides, and the bottom drawers have traditional center mounted run guides. For the wood I used Avodire, a tropical African hardwood, which I discovered at Midwest Lumber’s purge a couple years ago. I had never heard of Avodire before and was intrigued by its creamy light color. I think I bought the whole supply! I have enough left for a couple side tables. As with most of the wood at Midwest, this stuff was probably sitting around in the rough for decades – so I really didn’t know what it would look like after it was milled. In general I prefer clear, straight grained wood over the figured stuff, and after I had run through the machines I had a nice mix of both. 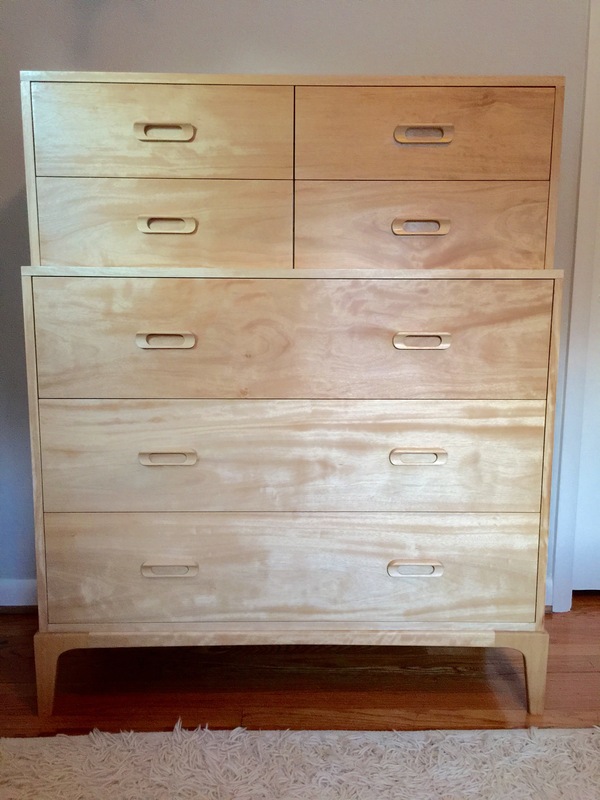 I used the straight grain boards for the sides, and moderate figure for the drawers and heavy figure for the top. Poplar was the secondary wood for base, back, dividers and drawer sides and backs. Case construction was half blind dovetails to connect the base, floating tenons to secure the top, and sliding dovetails for the concealed dividers. 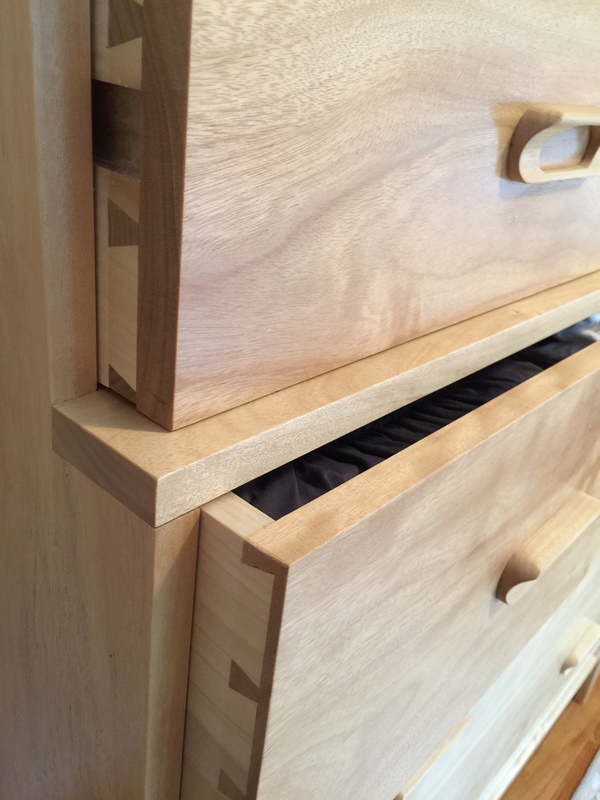 Drawers were dovetailed all around. I also made the handles out of Avodire as well, will put up a separate post on how those were made. For the finish I wanted to keep the wood as light as possible, so I only applied shellac that I mixed with Super Blond BT&C Tiger Flakes, and buffed to a soft luster with steel wool and Ruelle Restorations Natural Beeswax Paste. The result is hallmark traits of a shellac/wax finish – sublime and soft to the touch!